When I taught ESOL (English for Speakers of Other Languages) Social Studies in Florida a decade ago, I recall the story my Nicaraguan translator told me about her harrowing immigration into the United States and her years here before becoming a translator/educational assistant. A former principal, she and her husband ended up on the bad side of the Sandinista government. While her husband was able to get asylum while overseas, she and her three young children had to negotiate with the coyotes in order to be smuggled out of Nicaragua and into the US. She told of sleeping in pig pens, traveling in a UPS-style truck with the top peeled away, crammed like sardines for hours at a time, as well as a few moments where if the wired money didn't arrive in time, she and her children would have been shot. While this alone would make for a great story, the rest of her life-tale, that of having to learn a new language, not being able to practice her profession for years, having to clean toilets and make beds for a hotel chain and later for a rich family, left her crying herself to sleep for most of the two years following her flight from Nicaragua. Her story, while perhaps the most powerful, was one of several I learned from co-workers and students alike over the years. While I didn't press my students to give details of their immigration experiences, I did notice a few commonalities in the frustration, confusion, desire, hope, and all the other tangled knot of emotions that occur when one is suddenly removed from familiar environments and thrust into another. Yet their narratives, or analogues to them, are not often what is discussed in American news when it comes to immigrants. No, the stories tend to revolve around the issue of undocumented/"illegal" aliens, of Social Security number manipulations on pay stubs, of street violence among the mareros. Exciting as these violent narratives may be, they really do not tell the breadth and depth of the immigrant experience, particularly that of the Latino/a population, in early 21st century United States. 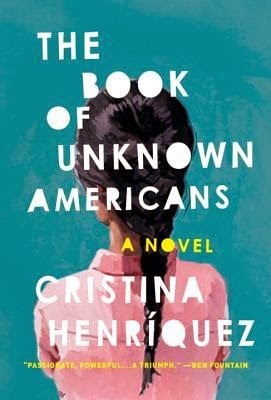 Therefore it was with great interest that I read Cristina Henríquez's second novel, The Book of Unknown Americans. It is a multi-person narrative that weaves together the lives of two families, one recently arrived from Mexico, the other a family of naturalized citizens from Panama, into an evocative tale that grips the reader's attention. There are times where the novel becomes sentimental, but it never verges on the maudlin, instead becoming a showcase for the experiences of those "unknown Americans" who walk our streets, cook our meals, clean our rooms, build our roads, and who have given so much of themselves in order that their families might have a good life. The Book of Unknown Americans utilizes revolving first-person PoVs in order to construct its intricate plot. At the center are two mothers, Celia Toro (Panama) and Alma Rivera (Mexico), and their two teenaged children: Mayor and Maribel. The Riveras have immigrated to suburban Delaware in order that Maribel, who suffered brain damage a year before from a fall off of a tall ladder, might receive expert re-education and therapy from a renowned special education school in the area. Mayor, the younger, less athletic brother of the town's acclaimed soccer prodigy, struggles to make his way through school. We see through his PoV him being bullied by a xenophobic classmate, and his difficulty in asserting himself. Soon after the Riveras arrival, however, there is a change in Mayor and he becomes a protector/erstwhile boyfriend of Maribel. While this set-up may seem to indicate a coming of age story (and for the first half of the novel, I thought it was building to be such a tale), Henríquez takes the larger narrative in new and surprising directions. While Mayor and Maribel's teenage actions serve as a catalyst for much of the novel's drama, Henríquez's devotion to developing the two mothers' characters (and to a lesser extent, the fathers') pays dividends. One especially powerful moment is when Alma Rivera begins to take English lessons after a scary adventure following her missing of a bus stop on the way to pick up Maribel from school. She is lost, confused, and Henríquez illustrates this vertiginous feeling of anxiety, confusion, and frustration so well that I could not help but recall the numerous times that my ESL students and I struggled to communicate effectively to one another. Henríquez's prose, with its delicate, fragile quality of characterizing the lost mother, makes memorable so many seemingly less important scenes. As I noted above, there are so many fascinating characters who make cameo PoV appearances that there were times that I wanted to hear more about their stories, but Henríquez wisely makes the decision to narrow the focus to the Rivera and Toro families, utilizing other PoVs mostly to set up two major conflicts in the second half of the narrative. As a result, these conflicts have more power to them, because the reader has been exposed to the characters' lives and perspectives, making for drama that closely mimics actual human experiences. Yet if there were a drawback to The Book of Unknown Americans, it would be the disappearance of a particular PoV after the climax of the final conflict. I found myself wanting just a little bit more from that character, not for the sake of "closure," but more because it could have added to the bittersweet conclusion. Despite this, The Book of Unknown Americans is a nearly pitch-perfect novel. Its characters ring true to real-life experiences and their situations and internal/external conflicts feel all the more real due to the time and effort devoted by Henríquez to get their voices and stories "just so." While the conclusion surprised me at first, upon further consideration it fits well within the larger immigrant experience narrative that she set out to do. The Book of Unknown Americans simply is one of the best contemporary fiction novels that I have read this year. Very highly recommended.